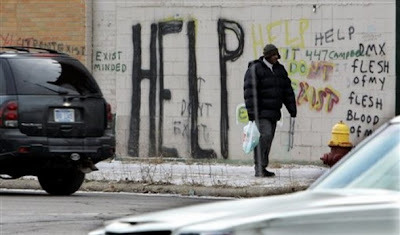 Whispers in the Loggia: In Motor City... and Beyond: "Do Not Be Afraid"
As the economic chaos continues to bore down, few local churches on these shores are feeling the brunt as is the 1.5 million-member archdiocese of Detroit. Christmas 2008 will undoubtedly be quite different for most of us. Given the economic uncertainty of the times and the fact that many have lost employment, and even their homes, we will be celebrating in a way that is more simple and modest. In fact, for many, there will probably be little reason for celebration and for some, perhaps no opportunity for celebration at all. No matter what our circumstances, every one of us feels somewhat overshadowed by fear about things we cannot control. We wonder where the future will take us – individually, in our families, and as a society. Our metro area and the automobile industry are going through a time of major transition, causing every one of us to take a second look at who we are and what we do. More than ever, we need to reflect on the hope-filled message of Christmas. Again and again in the Christmas Gospels, whenever an angel appears, consistently the message is the same: "Do not be afraid.…" Mary heard those consoling words at the Annunciation. Joseph heard those same words several times in St Matthew's account of Christ's birth. Aged Zachariah was given the same advice as he and his wife, Elizabeth, were about to receive the surprising gift – and challenge – of the birth of a son, John the Baptist. As I mentioned at the outset of the column, the shepherds who first heard the Good News were also commissioned not to be afraid. Fear is a natural human reaction; it is instinctive for humans to be afraid of the unknown or things that are unpredictable and unfamiliar. Every manifestation of God should make us feel a bit off-balance, overwhelmed by the surprising gift and mystery of God's presence and commitment to us in sending His own Son. We need the right kind of fear – "fear of the Lord," not fear of human forces. "Fear of the Lord" – one of the gifts of the Holy Spirit – means a loving respect for the wonder, majesty, and mystery of God – all powerful yet humbly very near to us. As we grapple with fears within our hearts and fear around us, we need to be ever-more sensitive to the voice of the Holy Spirit trying to calm us from within, assuring us that not only will we survive but we will indeed grow closer to God as we give up any false pride or illusive desire for control. We need to set aside human fears and embrace fear of the Lord. The Christmas story reminds us of the way God chose to show His abiding love for us – by sending His Son to dwell among us at a particular point in time and to a particular group of people. He came in such a hidden way that no one recognized His presence. The message of Good News was first proclaimed to shepherds, people who were social outcasts and, therefore, not acceptable or credible witnesses. Yet the Lord entrusted to them the Good News and commissioned them to share it. Why did He pick shepherds? Possibly because shepherds had to be people of great courage, spending all night through every season guarding and protecting their flock from wild animals. Shepherds were attentive and patient, humble and strong – an excellent combination of traits, the same qualities we need in the midst of these challenging times. The Christmas message has a very intimate and personal quality to it, but at the same time, the Christmas experience is a public and communal event, a manifestation for all to see, a mystery for all to encounter and share. We need to express our faith in public ways – participating in the Mass and the Sacraments, singing Christmas carols, putting our faith into action through visiting the sick and reaching out to the disadvantaged, proudly displaying our Christmas creche and so forth. As we do these things, however modest or simple, we are helping to proclaim a hope and a joy to our brothers and sisters in these times of darkness and anxiety.